Reading reflections are designed to encourage students to complete readings before coming to class, to reflect more deeply on the content of the reading, to make personal meaning from the meaning, and to develop their metacognitive skills for lifelong learning. The reflections consist of three questions: (1) What is the main point of the reading?, (2) What information did you find surprising? Why?, and (3) What did you find confusing? Why? Students submit short responses to two of three questions prior to coming to class. Metacognitive components of the activity Reading reflections address many elements of metacognition, including knowledge, control, and reflection. Reading reflections are designed to help students develop knowledge about themselves as learners, learning tasks (reading), prior knowledge, content, self-monitoring, self-assessment, and reflection. Metacognitive goals The primary goals of this activity are to help students develop their skills of self-assessment, and to reflect more deeply on the content of their reading assignments. Reflective thinking is an essential element of expert learners, so this activity helps students develop skills as intentional learners for lifelong learning. 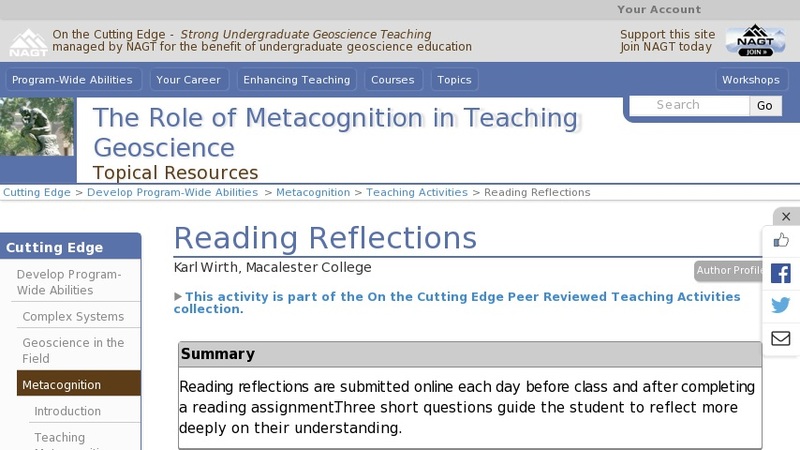 Assessing students' metacognition Reading reflections (n = 35 in a typical semester) count for approximately 10% of the course grade. I do not grade these reflections, but give students credit if they are turned in on time (before class) and if they clearly demonstrate significant reflection.